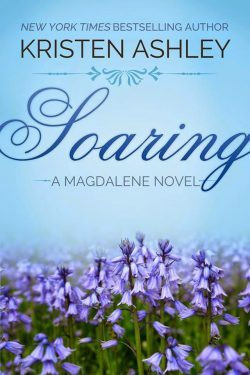 Soaring is part of Ashley’s Magdalene series. Unfortunately, I did not love the 1st book, The Will. But I was very happy I stuck with this story-line because I really loved Soaring. I’ve noticed that while Ashley is still rather verbose when it comes to describing exactly what someone is wearing and how their homes are decorated–this is just part of her writing style–she has definitely heard her readers when it comes to the speech patterns of her alpha males. For quite a few books, they all had the exact same way of speaking and it was just above that of a cave-man. Just because you’re a man’s man, doesn’t mean you’re uneducated and can’t complete a sentence. Let’s dive in! Amelia is a 47-year old, divorced, mother of 2 teenagers. Oh, she’s also an oil heiress–which in this case means she doesn’t have to work or worry about money, but that certainly does not put this in the category of other billionaire love stories. Amelia lost her children to her neurosurgeon ex-husband, Conrad, and his wife because of Amelia’s crazy public antics when she found out that Conrad had cheated on her and was leaving her for his girlfriend. She’s now followed them across the country, from CA to MA, to get her life back on track, prove to everyone, herself included, that she’s changed, and is worthy of being a custodian and mother to her children. Cue Mickey, the 48-year old, divorced, father of 2–a teenage girl and an 11-year old boy–who lives across the street from Amelia. Mickey’s a construction worker and volunteer fireman. While he too is an heir–to a frozen seafood fortune–he has chosen to shun the money and find his own way, apart from the family business. It’s not the easy existence it could be, especially since his ex-wife is an alcoholic barely holding it together in the joint-custody agreement he has with her over their children. Much of this story is about Amelia finding her way and who she is. How she can’t live her life for the approval of her parents, how her needs are important, and above all, being the best mother she can to her kids. Again, so many relatable topics. And of course, there is the fun and heart-warming love story of Amelia and Mickey. Which doesn’t have the smoothest start–especially since they initially date other people. In today’s age of trying to do what’s right, divorce, starting over, finding yourself, and love, after 40–Ashley does an amazing job of addressing heavy current-day topics (bullying) while keeping the tone light-hearted and fun. Looking forward to the next and final installment in this series!